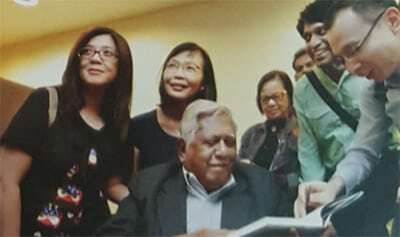 Was this SR Nathan’s last public appearance? The Labour Movement had always been Mr. Nathan’s first love. Unionists and union leaders from all over Singapore had the opportunity of seeing him in what could most possibly be his last public appearance on the 19th of May 2016 at the NTUC Center. It was a dialogue session between him and union members organised by the Ong Teng Cheong Labour Leadership Institute. The beloved ex-President left many lessons that would remain forever as a part of the Labour Movement story. “I learnt that it is the place where the small man can rise. Without educational qualifications, without the advantage of status, age and experience, you may go in as a small man. But with experience, and learning, you improve yourself and you develop a courage… to stand up for a cause”. “We have a duty to be our Brother’s keeper, our Sister’s keeper. Sometimes they’re wrong, you have to hold their hand and go to them. Sometimes they’re unreasonable, you have to be patient. In the Labour Movement, it is not as simple as banging the table, we have a lot of responsibilities”. “there comes a time when there is a larger interest. And that larger interest makes you think about why you are here. The point is that you have a duty, and we are in the Labour Movement for a particular purpose, otherwise we’d be somewhere else”. “No situation is the same. What I experienced in one situation may not work in another. There is a very area called interest that can only be reconciled. We must always bear this in mind in negotiation. Sometimes in situations, you have to improvise, and you have to think of yourself and find the answer. The Labour Movement has all the experiences for that”.